A beautifully light fragant dish with flakes of peppered smoked mackerel, fluffy basmati rice and perfectly soft boiled eggs. Originating in India and believed to be brought back to the UK by British Colonials, it was introduced as a breakfast dish but I personally love this dish for dinner when I fancy something light but wholesome. This version of the recipe is inspired by my dad. My dad has always had a way with food, a little something I like to think I may have inherited from him. He is able to throw any ingredients together and somehow manages to make the most fabulous dishes and this dish a prime example of that talent. Last week whilst having our weekly father-daughter catch up meal, he threw a few simple ingredients together and made the lightest kedgeree I have ever tasted. This dish is my best attempt at a replica of the one he produced that night because the only problem with my dad is that he never quite knows how he throws his dishes together, so this is my version from observing him. Fill and boil the kettle. Rinse the rice in cold water and then leave to soak in a bowl of water. Melt the butter in a pan, add the onion, garlic and spices, lightly season and fry on a low/medium heat for 10 minutes. Prepare the stock by adding boiling water to the two fish stock cubes in a jug and stir until dissolved. After the 10 minutes strain the rice and add to the pan, coating the rice well in the butter spice mix. Add the fish stock to the pan and simmer on a low/medium heat for about 10 minutes. As needed add a little extra hot water to the pan. Whilst the rice cooks, place 4 eggs into a pan of cold water on a high heat and bring to the boil, then reduce the heat and simmer for 4 minutes. For a harder boiled eggs cook for 6 minutes, instead of 4 minutes. Whilst the eggs cook, break up the fish and remove any remaining bones and chop the coriander. Once the eggs are cooked run the pan under cold water and put to one side. After the 10 minutes add the peas and fish to the rice. Peel and slice your eggs ready for serving. Once the rice is soft and cooked, remove from the heat and add the coriander. To serve divide between the bowls and place an egg on top. 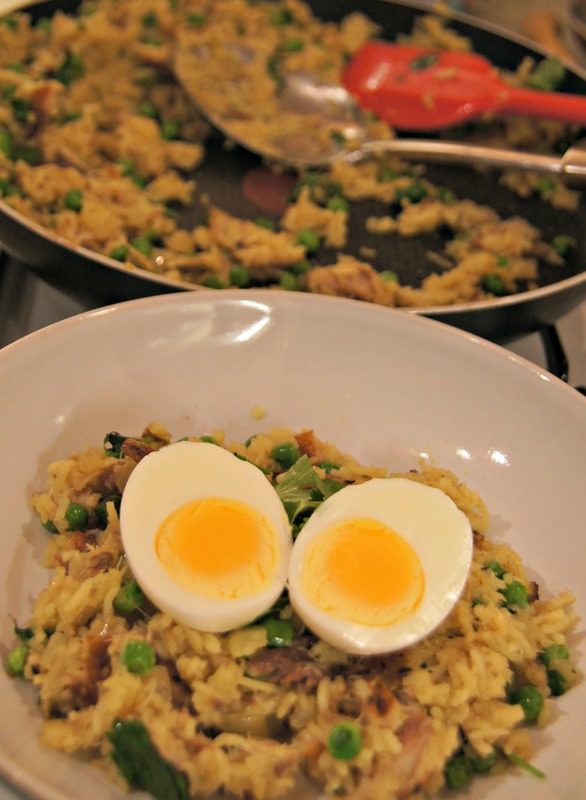 This entry was posted in Dinner, Lunch and tagged basmati rice, butter, cardamon, coriander, cumin, dinner, eggs, fish stock, garlic, gluten-free, glutenfree, health, kedgeree, onion, peas, shedding the wheat, smoked haddock, tumeric. Bookmark the permalink. I love mackerel and especially the smoked. It gives so much flavour. This looks amazing. Unfortunately one bean in our house doesn’t eat this. You will have to make me some when I come over instead.